Tomorrow(or today I guess) is Easter and although I don't normally celebrate, I had to pull out something pastel-ly to wear for the occasion. Looking through my untrieds, Jindie Nails Rave stood out so I've got that for you to see tonight. 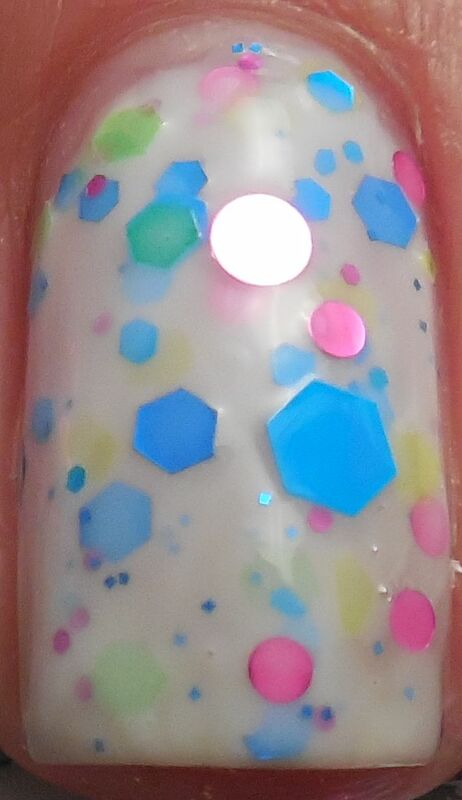 It's a white crelly base packed with neon hexes in yellow, green, blue and pink along with fuchsia colored circle and blue microglitter. I had a lot of trouble with the formula in that it was a little too watery. The polish wanted to pool along the edges and the glitters wanted to drag towards the tip of the nails so I ended up dabbing the last coat to get the glitters to spread out evenly. Not fun. I used about three coats and a layer of SH Insta Dri. Despite the difficult formula, I like the end result because it reminds me of speckled Easter Eggs. I'm on the fence about keeping it in my stash - there are better performing indie polishes out there with similar coloring but I do love name Rave because it reminds me of my younger days(yes, I was a child of the 90s and that's what we did). Glowsticks anyone? Too bad about the formula, perhaps layering it over white would be better? I would keep it!